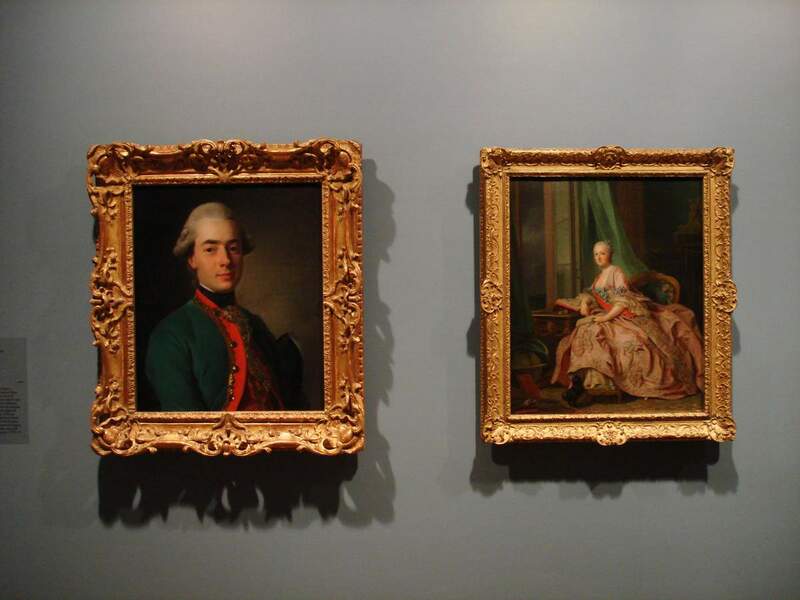 Perhaps the best example of the Rococo portraiture at the NGV is Alexandre Roslin’s portrait of Princess Anastasia Ivanovna Troubetzkaia, Countess von Hessen-Homburg. Alexandre Roslin (1718-1793) was born and trained in Sweden, but the bright lights of major European cities beckoned, and in the 1740s he first moved to Berlin, then in the 1750s to Paris, and from the middle of the 1770s he found himself in St Petersburg, where he was extensively patronised by Catherine the Great, her family, and her court. In 1757 he was commissioned to paint a portrait of a Russian aristocrat, Princess Anastasia Ivanovna Troubetzkaia, widow of Field-Marshal Ludwig Graf von Hessen-Homburg. She was a close friend of Empress Elizabeth of Russia, and was appointed her lady-in-waiting upon Elizabeth’s accession to the Russian Throne in 1741. We see the Princess in the portrait wearing the Grand Order and sash of St Catherine the Martyr, which was allegedly given not only to the Empress’s favourite ladies-in-waiting, but especially to those who supported her during the coup of 1741, which brought the Empress to power. Every detail in the portrait provides us with an insight into the Princess’s life and character. Books, letters, seals and writing implements attest to her excellent education and epistolary proficiency; the globe in the foreground and a seascape seen through an open window attest to her reputation as a great traveller. The Princess was a renowned Francophile with an impeccable taste, who spent quite a few years living in Paris. 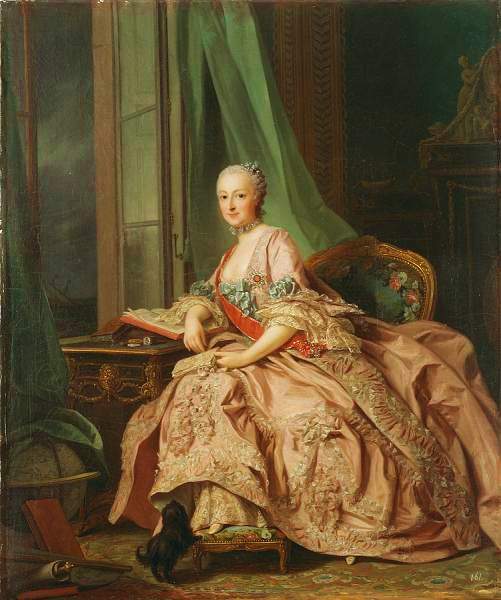 We see her in this portrait dressed in the latest French fashion in a richly decorated gown of pale pink, and seated within an interior filled with sumptuous Boulle furniture. One of the interesting quirks of the picture is that the portrait is actually posthumous. 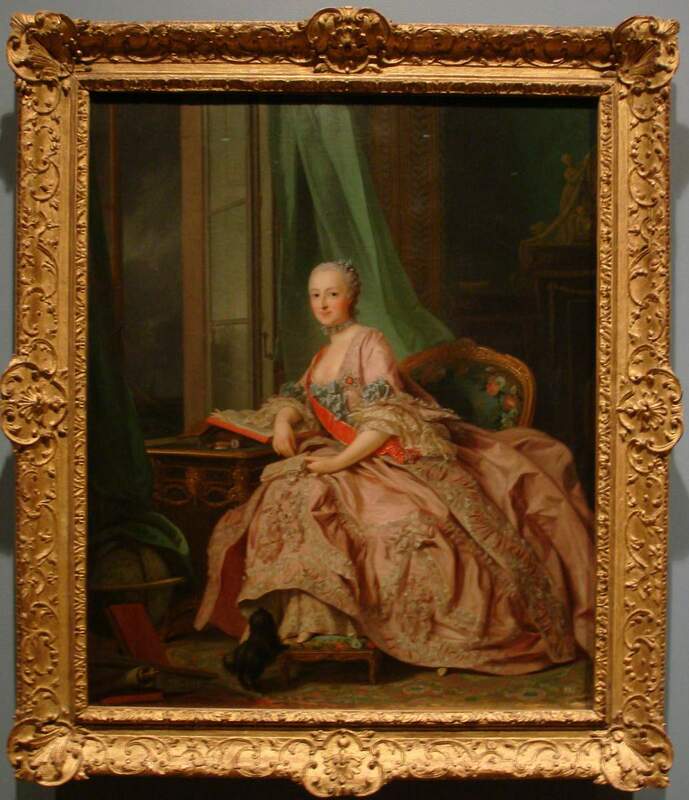 The Princess passed away in 1755, and the portrait was painted in 1757. Roslin recreated the “living likeness” of the Princess perhaps by relying on a contemporary miniature, while the pose, dress, and the interior are influenced by (and perhaps are loosely based upon) portraits by François Boucher of the celebrated royal mistress, Marquise de Pompadour, who was likewise renowned for her wit, taste, and glamour. The Princess’s face, details of her dress and jewelled decorations, embroidered upholsteries and gilded furnishings are carried out in the most minute, barely perceptible brushstrokes. The detailed execution of this portrait belies its modest size (the portrait measures 63.5 x 53 cm only), and gives the portrait a sense of intimacy. This is one of the distinguishing characteristics of the 18th-Century Rococo portraiture, as is the playfully frothy gamut of lighter pinks and greens. The repeating undulating curves of the flowing drapes, garment folds, and furniture decorations encapsulate the spirit of the French Rococo within this charming and remarkable painting. Nicholas de Largillièrre (1656-1746) was one of the most prominent French painters of the late Baroque era. His talents were quite versatile, and the artist was very proficient in historical, landscape, and still life genres, as well as portraiture for which he is perhaps best remembered today. He scaled the heights of the official establishment, becoming Director of the French Royal Academy, and among his most distinguished sitters were the Royal Families of France, as well as French and European aristocracy. The National Gallery of Victoria has Largiellièrre’s splendid portrait of Augustus III of Saxony, King of Poland (1696-1763), when the young price was only in his late teens. He was the eldest son and heir of Augustus II of Saxony, King of Poland (1670-1733), who was as famous for his military and political acumen as he was for his patronage of the arts (and scores of illegitimate children). Among the most famous achievements of the latter is the famous Staatliche Kunsthalle in Dresden, as well as a number of other fine buildings in Poland and Saxony. 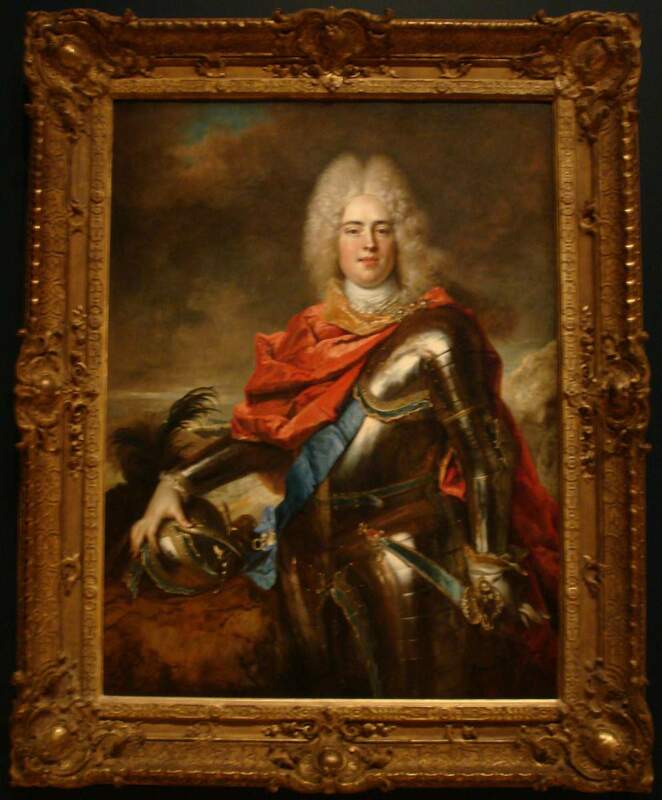 It was most likely Augustus II who commissioned from Largillièrre a portrait of his son, which represents the young prince in full military armour, ready to inherit and uphold his father’s honour and legacy. The gleaming cold of the armour is softened by the satin blue sash of a royal order as well as the red of the cloak that romantically swirls around his figure, enlivening the overall colour palette and bringing forth the sense of energy and bravura within the painting. In a more quite vein is a portrait by Largillièrre’s compatriot, Jean-Baptiste Perronneau (1715-1783), another fine French painter, whose portrait in the collection of the National Gallery of Victoria tends to be frequently overlooked. His portrait of Petrus Woortman (1771) differs greatly from the Baroque grandeur of Largillièrre perhaps owing to a more intimate nature of the Rococo portraiture, the artist’s Dutch training and the influence of the Dutch school, as well as the fact that Perronneau was perhaps more renowned for his portraits in pastel, which usually call for a smaller, more intimate scale. 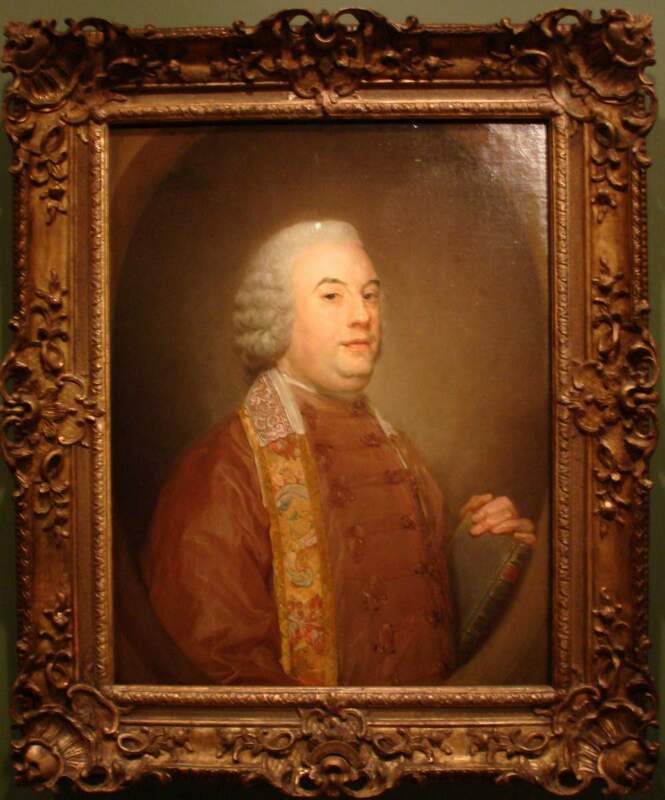 The artist does not flatter his sitter, and one feels that he had perhaps achieved a greater and more sympathetic character study of the portly prelate in sombre ecclesiastical robe with richly embroidered stole and a Bible in his hands as opposed to Largillièrre’s more bombastic representation of the young Saxon prince.